I don't envy the food industry spin doctors their jobs, as at least some of them must realize how ridiculous their arguments are to folks who take the time to critically appraise them. Take for instance Justin Sherwood. 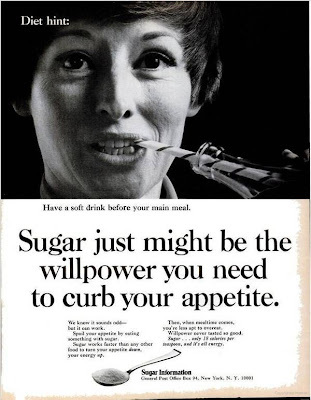 Mr. Sherwood is the President of the Canadian Beverage Association and just this week he was tasked with defending sugar as a contributor to obesity, diabetes and heart disease. "The Canadian beverage sector is committed as an industry to providing a variety of products for every lifestyle and occasion through our expanding portfolio of low-and no-calorie beverages, smaller package sizes and through our voluntary, national industry calorie label initiative, Clear on Calories, that provides clear calories information on front of pack to enable informed purchasing decisions and consumption"
"Contrary to the vast amounts of nutritional science available, the article, based on one controversial study, inaccurately tries to paint the consumption of sugar-sweetened beverages as a direct contributor to obesity, heart disease and diabetes." "Research shows that no one single food or beverage can be linked to obesity, and scientific evidence does not support that sugar, in any of its various forms, is a unique cause of any health condition." "No one single food or beverage alone is responsible for people being overweight or obese. All calories count from whatever food or beverage they come from." So is Mr. Sherwood right? Is there only a single study out there linking sugared soda as a primary contributor to rising rates of obesity, heart disease and diabetes? For a brief summary of literature, here's one from Harvard's Frank Hu. I'm not sure how much money Mr. Sherwood takes home each year but I sure hope it's a great deal. It'd have to be in order to make up for the impact his statements must have on how folks might perceive him as a person. "I read with interest the article, "Sugar can be found in unexpected places (April 9 2012)" in The London Free Press. Contrary to the vast amounts of nutritional science available, the article, based on one controversial study, inaccurately tries to paint the consumption of sugar-sweetened beverages as a direct contributor to obesity, heart disease and diabetes. The Canadian Beverage Association would like to provide scientific facts on the consumption of sugar-sweetened beverages. Research shows that no one single food or beverage can be linked to obesity, and scientific evidence does not support that sugar, in any of its various forms, is a unique cause of any health condition. Statistics Canada's own data indicates that, full calorie soft drink consumption has declined by 30 per cent in the past 11 years but obesity continues to rise-these numbers alone show that there is no link between the two. The international scientific community disagrees with the direct association of sugar consumption as the cause of health issues. For example; & From the Canadian Sugar Institute; "Through scientific reviews such as the Institute of Medicine Dietary Reference Intakes (DRI) report, does not support the view that sugar is "toxic" and a cause of non-communicable diseases" <#_ftn1> & The Dietitians Association of Australia (DAA) "believes it is simplistic and unhelpful to blame sugar alone for rising obesity rates and other related health problems across the world" <#_ftn2> & British Nutrition Foundation: "Current evidence does not support the dramatic claims about the association between sugar and health"  <#_ftn3> No one single food or beverage alone is responsible for people being overweight or obese. All calories count from whatever food or beverage they come from. The Canadian beverage sector is committed as an industry to providing a variety of products for every lifestyle and occasion through our expanding portfolio of low-and no-calorie beverages, smaller package sizes and through our voluntary, national industry calorie label initiative, Clear on Calories, that provides clear calories information on front of pack to enable informed purchasing decisions and consumption. "